The punk-electronica duo will play at our Clubnight in Munich this Friday, March 29. 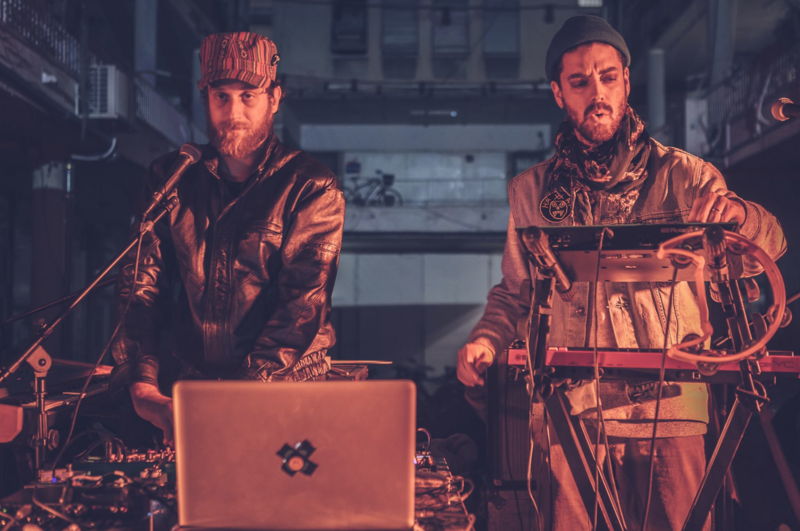 Tel Aviv natives Dori Sadovik and Niv Arzi have been making music together as Red Axes for almost a decade. But even before their most recent musical endeavor, which pairs elements of new wave, post-punk, psych and more contemporary dance floor music, they were in a band together playing rock. When they began to experiment with synthesizers and DJing a number of years later, their early sensibilities for ’80s-hued retro informed their sets and compositions. In 2019, Sadovik and Arzi are at the peak of their careers. They’re headlining major festivals around the world, traveling to Africa, Vietnam and India—among other locations—for highly-publicized collaborations and they’re releasing a steady stream of albums and EPs. (Not to mention making frequent appearances at Berlin’s Panorama Bar.) They’ve also started their own label, Garzen Records, as a platform for Israeli artists who share their unique vision for punk-indebted electronica. Despite their busy schedules, however, they found the time to sit down with TEB editor Chloé Lula to talk about their roots, the difficulties of breaking out of the scene in Tel Aviv and the exciting projects that they’re preparing for this year. Red Axes will be playing our Telekom Electronic Beats Clubnight at BLITZ Club in Munich on March 29. RSVP on the Facebook event here. You have a very original take on the marriage of synth, new wave and post-punk with contemporary dance floor music. What compelled you to bring these sounds together? Dori Sadovik: We really came from this new wave background. Niv and I had a band together then and we really like Joy Division and other ‘80s post-punk and new wave bands, but we just did rock n’ roll music. When we started out with electronic music, we wanted to keep on doing punk and new wave, but we wanted people to dance. Niv Arzi: People say that we have so many new wave influences. But what I hear more than anything is blues! Nobody ever asks us about it. Even though our last album had so many blues influences. DS: Well, I guess everything came from the blues in the end. We were really influenced by all of that in the beginning because it was really hot. We had just come from that. I was playing guitar and singing, and we didn’t play any synths. But as we grow, we go back to many of these early influences. This attitude came from the start, where we came from. Do you ever have conflicts over your respective visions for Red Axes? NA: To be honest, I think we’ve both always known that we want to perform in front of people and see them dance. I don’t remember us playing a lot of ballads, even with the band. We’ve always just wanted to see people get crazy, and we like to be that way ourselves during our performances. DS: I don’t think that there’s ever been a big conflict about any of this between us, and we have really good communication. Either of us can do whatever we want. And we share this really special thing. We have it in our hands and know what we want to do together and what we want to achieve. What is the Israeli scene like, and in Tel Aviv especially? In previous interviews you’ve described it as an “artistic island.” Why is that? NA: Actually, I would say it’s more like a greenhouse. DS: Yes. It’s like a greenhouse, but for the good and for the bad. Not many people can take their art outside of Israel, it’s not so easy. It’s a language thing…so many good bands here can’t do the crossover. Nobody speaks Hebrew, you know. And we’re not actually in Europe. You can get really, really good and go far, but it’s not so easy all the time to go to the world outside. NA: It’s hard to get recognition outside of Israel. I remember when we started it was very hard. I think people think of Tel Aviv as being a random place, or as being pretty far away. DS: When we started, the electronic music scene was really small. It was mostly trance music that was big, and artists like Guy Gerber. NA: If you’re doing electronic music now, though, it’s a becoming easier to get out of Israel. It’s hard to feel isolated because of the internet, and it’s easier to find references and grow your influences. DS: People here are really doing a lot of art, and not only music. I think there is a lot of energy in Israel and in Tel Aviv specifically. So many people are working on video and design and drawing and music. In the last year, a lot of these people have become good friends, and you feel like there’s good sharing and that people really want to grow in the scene together. 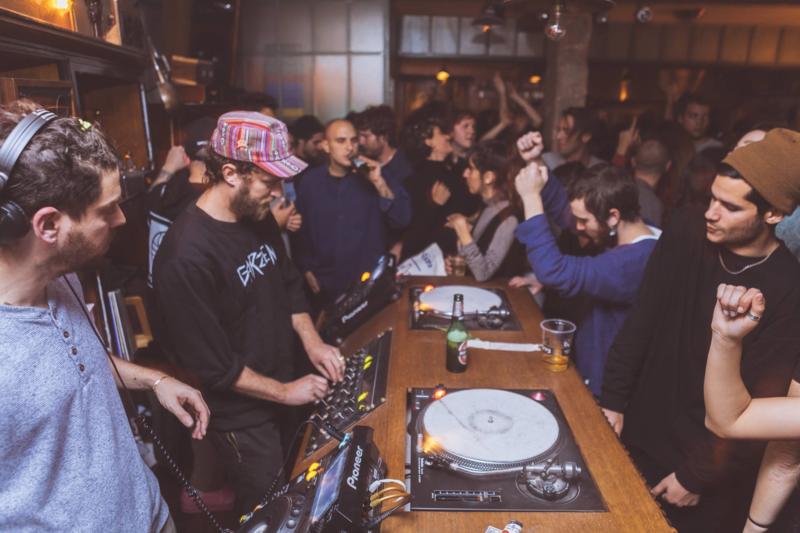 Your label Garzen Records has become a platform for Israeli artists in recent years. How are you curating the releases? NA: It’s mostly a place where we can release some of the bands that we like and producers that haven’t been discovered yet. The music can also go quite far away from the dance floor, especially towards psych. I see this label as a place where we can take a jump, find artists and give them a little bit of help to start releasing music professionally so they can grow. There are a lot of talented musicians in Tel Aviv, so I feel like it’s really important to have this place. What does your production process look like? You use a lot of non-electronic instrumentation in your releases. DS: We only use non-live instruments when we’re on tour. We have two work flows: either in the studio when we’re trying to write something with guitars—this is all really outside of the box, when we’re not working in the computer and just using analog synths and other weird stuff—and then there’s the big world of DJing and editing that’s really collecting music. That’s really “in” the computer. Same for when we’re making edits and remixes and things we’d like to play. This is all stuff we do with the computer only. NA: Our approach is also different when we’re traveling. We can be on the flight, and Dori will just open the computer and make an amazing track with stuff that’s already in there, like with new things we recorded and some older cuts. And it would sound to you like it was played with live instruments! Because a lot of production is just how you deal with what you have available. DS: We’re going to finish this thing we’re doing called Trips. It started when we went to Africa one time to play, and we said, “Ok we’re here, we really want to play with local artists and make some collaborations.” Now we’ve also done it in India and Vietnam. We’re not searching for electronic artists. Everyone that wants to play with us can! We’re going to music schools in these places and doing a session and making a track together with these kids. NA: We do it in a workshop style with these kids. When we’re booked in a cool country, we’ll choose to stay there and do this. DS: We’re in the middle of finishing the project. We’re putting out Vietnam in two months and India will follow, and we already have the first one out. And then we’ll see where we’ll take it. NA: We’re releasing all of the music with the label K7!, and all of the money that comes from the records we’re giving back to the communities or the schools that we worked with. So it’s kind of give and take, in a way. It’s very nice. We also went there with a cameraman and our manager to all of these visits. We’re trying to find someone to do all of the footage. What have you taken away musically from these collaborations? DS: The people we’re playing with have different instruments, they play with different scales and there’s different energy everywhere—some countries play with more highs or more lows. There are so many differences. I think what’s really nice about these records is that you can really feel it. Somehow you can feel their vibe. NA: The atmosphere of the place, the atmosphere of the people and the community—it really shows. Especially in Vietnam, you can hear it in every different track. It sounds very traditional. DS: We have another project with DJ Tennis, who we did an album with. That will be out this year on Life And Death. The biggest thing we’re doing is our next album, which we just finished mixing. NA: It’s an album that was very much influenced by the place we’re in now in our careers and from the trips that we’ve done and the bigger sets we’ve been playing…it’s very much answering the question of where Red Axes is now and where Red Axes wants to be. We’re very happy with the result. We think it’s going to be a surprising record. DS: It’s different from our past albums. We really, really paid attention to details and the sound design. We put an effort into taking these two or three last years traveling all around the world playing in all of these crazy places—sometimes for 5,000 people—and trying to somehow express it in sound. How has your career trajectory changed since you’ve risen in popularity so rapidly? DS: Everything’s been much more intense…we’ve been working much more on our live music, and we’ve really been doing a lot of traveling. Everything has really increased in the last two or three years. It’s not always so easy. We had some problems because of these things, but you learn how to deal with it. NA: Red Axes has grown and the work is much harder. I think that we’re expected to deliver more. Sometimes it’s more stressful, but on the other hand, you feel like you’re growing. It’s been a very cool journey. Red Axes will play our next Clubnight at BLITZ Club, Munich on March 29. RSVP to the event on Facebook here.